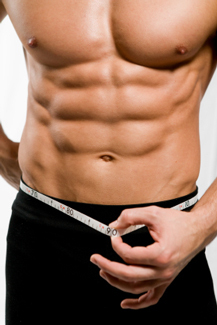 The best fat loss diet for men is NOT a singular fitness element. To burn belly fat and get defined abs, guys must combine making good food choices with workouts to increase lean muscle mass. Listen, male belly fat is an albatross around guys' necks. Not only is it a tremendous health problem, but it is a sexual turn-off to chicks. Who needs either of those problems? * There is NO "secret diet" to get rid of stomach fat. It takes TIME and focused EFFORT. * The drill is simple. To burn belly fat, you must: Eat Less...Eat Better...Workout More. That's it in a nutshell. * Forget about purchasing expensive (and worthless) supplements. Forget about drinking protein shakes. You'll end up putting on fat. The keys are better food choices and proven strength-building workouts. * To get the body you want, you must accept a lifestyle change that does NOT include eating whatever you want, or working out without a purpose. * It took time to put on slabs of fat...and it will take time to lose it. Do NOT fall for any nonsense that you will look like an Olympic decathlete in 10-12 weeks. Getting your mind right will be crucial for you. * The best fat loss diet for men will center on: Optimal nutrition to generate a weekly calorie deficit, strength-building weight workouts, and fat-blasting interval training workouts. The best proven program we've found to burn belly fat and gain lean muscle is The Truth About Six Pack Abs. It has helped 1000's of guys get a body women want to touch. What do women find attractive in a man's body? Are P90X results really worthwhile?